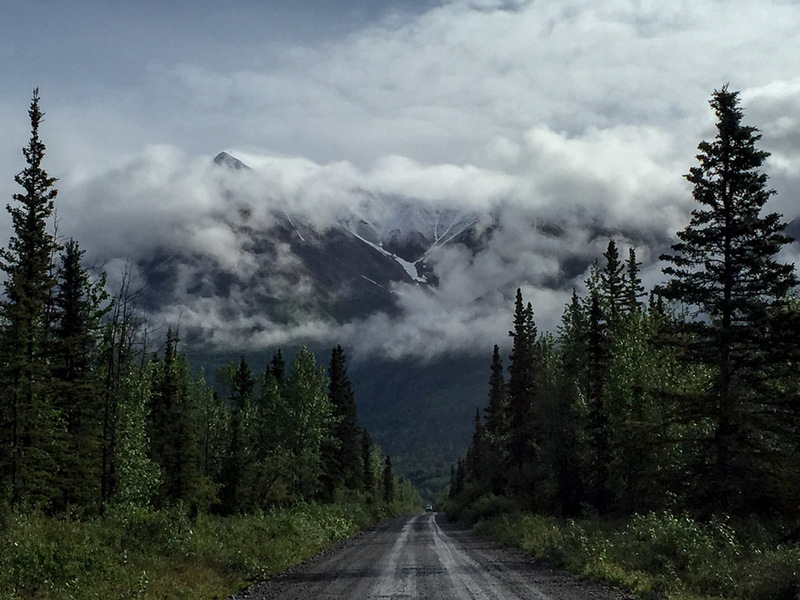 People insist – it must be mind-numbing to roll up and down the same bouncy road all day, but I say it’s not so bad. The scenery, admittedly consistent, is fantastic. The people, save a few sad souls, are happy, interested, and interesting. And I keep myself entertained by making a game out of finding the smoothest route for my wheels and keeping an eye out for animals up ahead. The vans get dirty quickly so we do our best to keep them clean for aesthetic purposes but also because the scenery can’t be properly appreciated behind a window caked in dust. 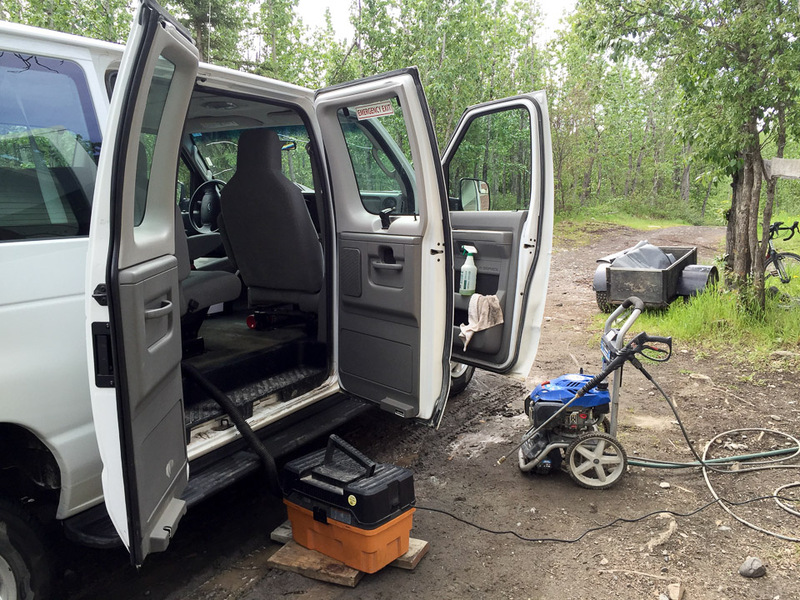 We pressure wash the outside, vacuum the inside, and simple green the dash and door panels. When I’m not driving or cleaning the vans I have other house chores to do. There isn’t any specific chore rotation that we employees are on. The policy is that if you see something that needs to be done, do it. One of our most necessary and charming chores is retrieving water. There’s a local spring a quarter-mile outside town that serves as McCarthy’s source of fresh drinking water. It’s a chilly 50F, and we drink it straight – no filtration required. The mossy aftertaste is balanced by the piece of mind that such a clean spring still exists at all in this world. This is our water truck and emergency fire truck. In order to keep any rocks or floating debris from being sucked up we put the hose into a sunken milk crate with wire screen around it. 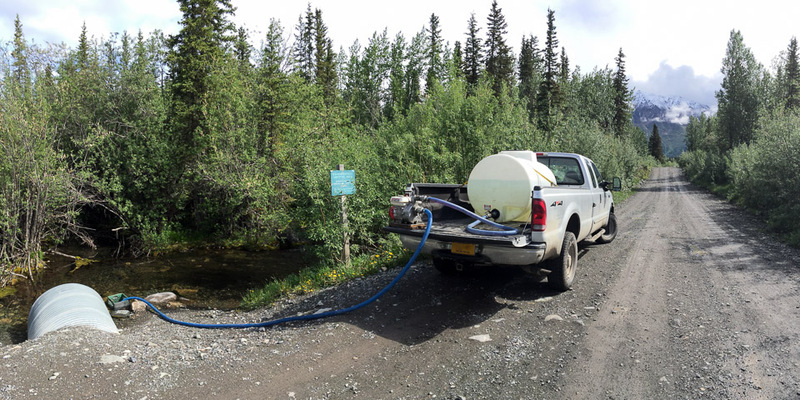 When the 300 gallon (1,135 L) tank is filled we head back to the crewhouse, switch the hoses around, and pump the water from the truck to the house reservoir. Between cooking, laundry, and van washing we have to refill it about every other day. There are other random odd jobs that come up too, like demolishing old wall tents or running supplies up to the airport, but my favorite money so far came from driving a client’s van to Chitna for them while they rafted from here to there on the Chitna River. I was then picked up by one of our pilots and flown back to McCarthy. 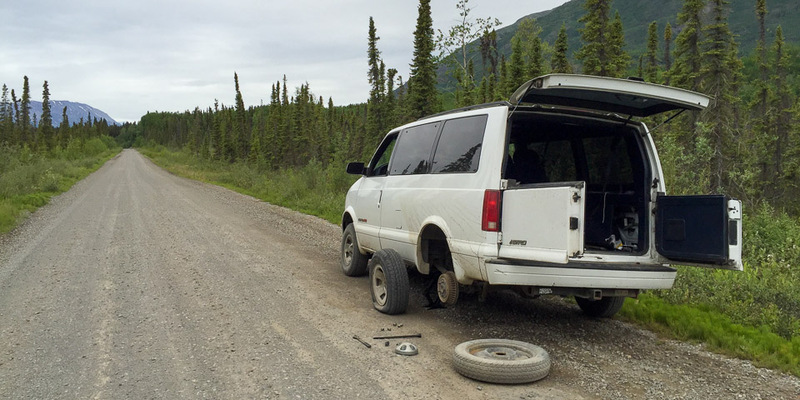 It all would have gone so swimmingly had I not popped a tire about 20 miles outside of town. 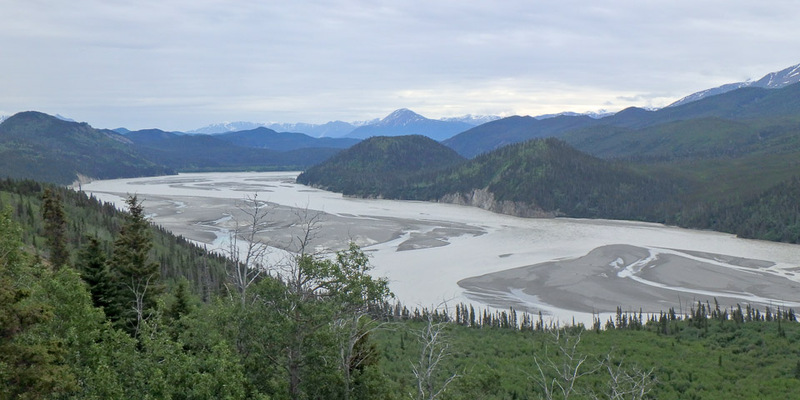 Chitina River facing east, upriver. Love keeping up with your adventures, where are you now? or are you wintering over in AK. You understand, so glad you are following your dreams. Thanks Carol – your appreciation means a lot to me. I didn’t stay up here for Winter, but I’m back again this Summer. That’s great you’re in better health than when I saw you last! I think the Big Island is just the place to settle in, but keep a sharp eye out for that hot oozing orange stuff! Mahalo for the note!